For Feet's Sake line is made from organic essential oils of Tea Tree and Spearmint. Our natural spa pedicure collection is guaranteed to soothe and condition the most tired feet and legs. 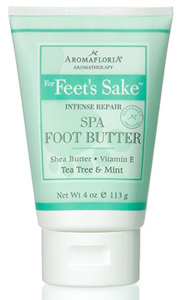 For Feet's Sake Foot Butter is an extra-moisturizing treatment that refreshes and restores over-worked feet. Repairs dry skin on feet, legs and heals. Softens and hydrates skin. How to Use: Apply to feet and legs while massaging with a circular motion for 2-3 minutes every night before bed time. You will feel and see the difference at once.